A deeply rooted concept in everyday life is causality; the idea that events in the present are caused by events in the past and, in turn, act as causes for what happens in the future. Physicists from the University of Vienna and the Universite Libre de Bruxelles have shown that in quantum mechanics it is possible to conceive situations in which a single event can be both, a cause and an effect of another one. One of the most deeply rooted concepts in science and in our everyday life is causality; the idea that events in the present are caused by events in the past and, in turn, act as causes for what happens in the future. If an event A is a cause of an effect B, then B cannot be a cause of A. Now theoretical physicists from the University of Vienna and the Université Libre de Bruxelles have shown that in quantum mechanics it is possible to conceive situations in which a single event can be both, a cause and an effect of another one. The findings will be published this week in Nature Communications. Guess we need a temporal double slit experiment, since quantum physics always goes back to that in some sense. Observe an electron from a beta source interacting with an electron from another beta source in some fashion where the order of the emission matters, and then look for strange interference patterns. The people often call such the retrograde causality a predestination or destiny, but the whole existence of scientific theories serves for effective prediction of future. When we can calculate, that some asteroid will hit the Earth in the 2036 year, we can construct the space-ship, which will compensate this risk for future. In this particular case the (awareness of) future event affected the presence of human observers. You won't get interference between electrons from distinct sources. That's why it's a two slit experiment and not a two source experiment. It's one electron going through two slits, not two separate electrons. When we can calculate, that some asteroid will hit the Earth in the 2036 year,we can construct the space-ship,which will compensate this risk for future. In this particular case the (awareness of) future event affected the presence of human observers. What you wrote is of course as bonkers as the "research" this article is referring about. So in that regard, your "arguments" about the future affecting the past, are about as substantial as saying "God did it", or Santa.. It would seem that nature employs intransitivity to achieve a timeless state. I suspect this mobius is a shadow of higher-dimensional timeless states which we as inferior low-dimensional beings are only able to infer with motion. "The real challenge is finding out where in nature we should look for superpositions of causal orders"
Suggestion: The relation between consciousness and brain? Consciusness is of course an effect of the state of the brain. But maybe consciousness can also (partly) be the cause of the state of the brain? "Université Libre de Bruxelles (formerly University of Vienna)"
Thats not correct, one is in Brussels the other one is in Vienna. Of course you do. The whole idea of the two slit experiment is, that the two slits act as two sources that interfere with each other when the single particle goes through both holes at the same time. This also has interesting theological and philosophical implications, as it removes the dichotomy between infinite causal regress and a prime mover, essentially invalidating the Kalam cosmological argument beloved of some apologists. The traditional two slit experiment uses only one source, and only one electron at a time. The electron is not thought of as a physical wave in that experiment. It is a wave-function of all possible paths,... the electron "feels-out" all possible paths and interferes with itself. However, yes, an entire quantum system of several particles, can be in such a superpossition, but if one can identify one electron from another, there will be no interference. If one chess texts which slit it went through, the interference goes away. The concept of Causality, like time, space, and substratum, etc,... are forms in which the mind orders experience. They are a-priori intuitions,.. built in functions of the mind that operate on and synthesize experience for consciousness. The mind has evolved on the macro-scale, therefore it has evolved faculaties appropriate in that realm,.. but not at the micro-scale. We presume causality, or force Reality to conform to it. Can we get away with this at the qm scale? Qm has shown the answer is no,... such was the quantum revolution, and break from the "classical". In other words, the non-intuitive nature of qm, is merely a epistemological problem. My previous post should have had this paragraph in quotes. Yes, but that's besides the point. The point is that any two sources of waves, whether it's mechanical waves, light waves, or probability waves, can interfere with one another. The point is that in the two-slit experiment where the electron is supposed to come out of one or the other hole, it forms an interference pattern because both realities are valid at the same time. We have to figure out a set-up where the outcome depends on the temporal order of the sources, and observe the analog of an interference pattern of light, but in time. For that we need a presumably random source, like nuclear decay, and a system that deflects the particles depending on which one came first. I've presented and published work on Causal Particle Theory. It is easy to understand that particle theory MUST restore Causality to its fundamental formulation, in order to be mathematically consistent with the rest of physical theory. Seiberg et al also published a paper which spells out a Causality criteria (which the standard model does not meet). The approach I've used both meets this crteria and is Consistent with Hartle-Hawking_Hertog Instanton theory. In fact. something like this was known since the earliest days of the electromagnetic model for light. James Clerk Maxwell defined light as mutually oscillating electrostatic and magnetic fields. But they oscillate in a special way. The oscillating electrostatic field gives rise to the magnetic field. But the magnetic field is also oscillating and, as it oscillates, it goives rise to the electrostatic field! So the oscillating electrostatic field gives rise to the oscillating magnetic field which, in turn, gives rise to the oscillating electrostatic field that gives rise to the oscillating electrostatic field! ,.. and then what happens? Maxwell's theory cannot account to quantum phenomena and reversibility of time arrow - so that the speculations about Maxwell's theory are essentially OT here. In particle model the vacuum is behaving like the elastic foam: if you squeeze it at some place, it will expand in perpendicular direction like the piece of jelly: from this aspect of behavior the duality of electrostatic and magnetic fields follows in AWT. After all, Maxwell has used a model of elastic fluid during derivation of his theory too. Despite of it, this model is strictly deterministic, until only transverse waves are taken into account. The things will become interesting, when we consider the much faster longitudinal waves too - and this is just the domain of quantum field theory. For temporal loops to be a real possible phenomenon the following must be true: the past, present, and future all exist. This spells deterministic universe. This means no freewill, only an illusion of choice. Meaning a human being brought back in time and presented with the same option an infinite number of times will always make the same choice. This destroys personal accountability, a persons actions in this scenario are like a running script, presented with the choice to murder or to not-murder will always yield the same result, the future already exists. Or case B: the past, present, and future all exist, all is predetermined, we are like a train on the tracks, our destination a known. 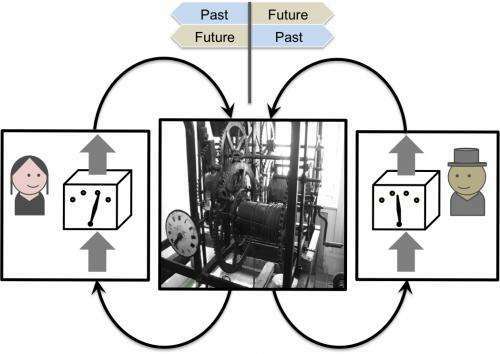 Only in this case is a temporal loop (causal loop), a possible candidate. In case B you can have an open track system (meaning no temporal loop), so the past began at some point and the future comes to an end at some point, we reside somewhere in between, presently. Under a temporal loop the train tracks loop back into the originating station. So the future ends in the past. The end of the line being the beginning of the line. Soft determinism (or compatibilism) is a popular topic now a days. It allows scientists to delve into deterministic studies without messing with the social systems in place today. After all, it would be immoral to blame someone for their actions, when in reality they have no control over them. In fact, it wouldn't even be immoral, because in a deterministic universe, no such thing as morality exists. With no freewill we are only executing a sequence of predetermined events. So soft determinism considers the universe as running a determined course (electrons always attracted to protons, etc. ), but states that actions of living organisms are indetermined. I don't think determinism and indeterminism are compatible. The Universe is one or the other in my opinion. I don't know which is more likely, but I hope it is the latter. But if we believe that quantum mechanics governs all phenomena, it is natural to expect that the order of events could also be indefinite, similarly to the location of a particle or its velocity", adds Fabio Costa from the University of Vienna. I have seen some theorize that the universe is expanding both forwards and backwards in the time axis, rather than just forwards. If this is true, then the past is continually being altered by the present and the future, even though we are somehow unaware of the effects locally. Consider this, if space is a made of 3 dimensions, and all 3 observed dimension of space are expanding, apparently, in both positive and negative direction, then why would we expect time to expand only in the positive direction? This would explain why the Sun appears exactly twice as old as the radius of the universe, if you start with the assumption that the Sun was once 100% hydrogen. If it has been burning both into the future and the past, it makes sense. Gravity, as far as we observe it in our day to day lives, is a linear force which is always roughly orthogonal to the tangent plane at the Earth's surface at our location. But this perceived "force" propagates out spherically in every direction. Yet, we do not say that one on the opposite side of the Earth experiences opposite gravity. We perceive the surface as an "origin" and in mechanics we normally calculate everything with reference to the surface. So we have a "directional" entity with spherical origins and propagation. Ok, so that's not a perfect example, but it's an attempt to show how a "beginning" can be something other than a point, without contradicting any science nor creation belief we have. The atmosphere begins at the surface of the Earth, an irregular spheroid, not a point. r2 = x2 plus y2. But negative values for time are discarded. see below. I don't know if this has been brought up here, but i read an interesting thing on DNA and Protein the other day, and this article reminded me of it. "In the very first cell (assuming that there was a "first" cell) what came first - the DNA or the protein? Of course, the protein that reads the DNA is itself coded for by the DNA. So, the protein could not be there first since its code or order is contained in the DNA that it decodes. Proteins would have to decode themselves before they could exist. So obviously, without the protein there first, the DNA would never be read and the protein would never be made. Likewise, the DNA could not have been there first since DNA is made and maintained by the proteins of the cell" could this be almost macro sized evidence of such quantum phenomena?? @Kron For temporal loops to be a real possible phenomenon the following must be true: the past, present, and future all exist. This spells deterministic universe. I disagree. I notice the brain is designed around tasks. Yet this is still an emergent property. More fundamentally neural nets appear affected by music. In other words slight forces of attraction are experienced by resonating networks in phase which depend not upon time, but affinity. The kinematic abilities of persons is an add-on interface which requires precepts such as dimension which is, after all, a purely human construct. By employing time and reason a human can realize slowly that he is embedded within a 7.1 dimension timeless world. It's evidence of creation and forward planning. When you design a computer or an encryption algorithm, it works the same way; you design any coding and decoding at the same time. You are certainly correct that the cellular mechanism of Ribosomes "reading" DNA to produce structures could not arise by accident or chance, because this event requires a "forward thinking" process of creation. In this case, reversing time doesn't even help solve the paradox you present. Regardless of the direction of time, only a creative mind could could develop both the code and the reader(the Ribosome) in one step. Viruses and Prions do not have Ribosomes of their own, and so they cannot possibly reproduce without high-jacking a cell first, because they need the cell's Ribosomes in order to build the structures they need for reproduction. Prevailing biology theories claim viruses came first and then cells, but this is not possible, because viruses can't reproduce without full cell hosts. So more than likely, the first viruses existed as secondary tools produced by cells for communication, maintenance, or even sexual reproduction, BECAUSE the cell has the Ribosomes and the other structures to produce the protein capsules of the Viruses. This would happen in the same way modern cells produce enter-cellular matrix (such as fibers between bone cells, or blood plasma). Therefore Viruses probably arose in the same way as enter-cellular matrices. The same could be said for Mitochondria. The first Viruses could have been cellular maintenance tools or immune/defense mechanisms against cancers or other enemy cells. Later, genetic mutation in the viruses caused some viruses to become pathogenic to the original species, and then over time enough screwed up changes happened so that viruses infect nearly all other life forms, though a virus by itself isn't usually considered a "life form" anyway since it can't complete it's own reproductive cycle. The whole point is that when the causal order of things is unclear, you don't really have a past that would determine the future or vice versa. The past and the future are how they have to be for the present to exist, and the present is what keeps changing and fluctuating. We are unaware of the change, because if it suddenly became true that Hitler had won the second world war, it would have always been true for us. In other words, viruses could have been developed by cells as "cellular drones," which seek out and destroy enemy cells, just like a UAV hunting muslims in the middle east. The original manner of deployment may have been exocytosis from the original host cell, but when in the target cell, the viruses grow out of control and destroy it. Over time, viruses out-lived their original parent cellular strains, so that physical evidence of this is hard to find. But it makes much more logical sense than the standard evolutionary model of "Viruses came first and somehow became more complex and magically gained Ribosomes and organelles of their own, and at some point they became cells". That's just silly, because cells do not have mere "fractal" complexity that could originate from a few reproduction accidents. Cells have "complicated" construction of many parts which are wholly different, yet fully dependent on one another, and as such, in most cases, could not arise accidentally.. Correct, you could not test this locally by writing a journal and checking to see if it changed, because anything that changed the journal would change the whole universe, including your memories of the universe. I proposed a way to test the theory above, however, by measuring the age of the universe under the assumption that most stars were pure hydrogen at some time. I've done the math for the sun about half a year ago, and it turns out the sun would need to be exactly twice as old as the mainstream theory age of the universe in order to reach it's present composition. If a large number of things appear to be twice as old as the universe itself, then that would be evidence for time moving both directions. what came first - the DNA or the protein? Of course, the protein that reads the DNA is itself coded for by the DNA. So, the protein could not be there first since its code or order is contained in the DNA that it decodes. Proteins would have to decode themselves before they could exist. The argument falls on its face when you realize that proteins are strands of amino acids much like, or even completely identical to RNA, and RNA can self-assemble and self-replicate without the help of a ribosome by simple random chemical processes. And what is DNA then? Well, it's simply doubled up RNA. The ribosomes and the DNA probably evolved out of bits of self-copying RNA because some strands of RNA automatically fold up into proteins and some of those proteins can catalyze the copying of strands of RNA, which would form a precursor pair for DNA and ribosomes. In fact, the ribosomes don't deal with DNA directly, but bits of RNA copied from the DNA. But that's off topic here. RNA is not single DNA, neither is DNA doubled RNA. RNA uses Uracil, instead of Thymine. Uracil is never in DNA. The same portion of a DNA double helix can, in principle, code for two completely different RNA molecules which in turn code for completely different protein structures, which is why the old theory of genetics is flawed. Because of this, changing one gene potentially changes multiple traits that would otherwise seem unrelated. That is all well said and done. I am not opposed to creationism. At some point, however, self-organization must have taken place. Yes. It is possible that a God, or a God type race, created the Universe as we know it. We could never gather information to disprove this hypothesis, but a problem arises (to infinity in fact), what created the God that created us? Even in a closed time loop - where God creates Himself - there is a question of the emergence of the time loop. We can speak of the matrix theory, or creationism, but this only locally explains reality. It fully defines the parameters of our Universe, but at that point the parameters expand. We are left knowing what we thought the Universe was, but now we know nothing of the bigger reality our "Universe" is nested in. I'm talking about the structure, not the particular amino acids used in them, as they are largely interchangeable. In a pool of random molecules, you get all sorts of strands with all sorts of combinations, some of which do something and some of which do nothing. There's no saying that DNA couldn't use uracil and RNA thymine - it's just that it doesn't. The entire point is, that it's dumb to ask which came first - proteins or DNA - because they are in principle the same thing. In other words, viruses could have been developed by cells as "cellular drones,"
Sorry lurker, real science proves you wrong. "Viruses share a common ancestor that existed over 3 billion years ago and may even have preceded cellular forms of life, according to a report in the May 3 PNAS by George Rice and colleagues at Montana State University." -But you have shown once again how your god is an ad hoc god. Remember, google is your friend. Your only friend. Common ancestry of a virus is irrelevant, even if it were proven, which I highly doubt it was "actually" proven. More often than not, people simply fill in absurd gaps. A virus as it is defined in any text book, dictionary, or encyclopedia cannot possibly have preceded cellular life, by it's very definition. "A virus is a small infectious agent that can replicate only inside the living cells of an organism." "an ultramicroscopic... metabolically inert, infectious agent that replicates only within the cells of living hosts." So the textbook, encyclopedic, and dictionary definitions of a virus makes it impossible for viruses to exist without cellular life. And if biologists have claimed that viruses predate cells, then they contradict their own definitions. Any "precellular" common ancestor could not have been a virus, by definition of the term. But it would not surprise me if evolutionary biologists contradict themselves, or re-define their own terms, as they do so all the time, particularly also in realms of so-called "abiogenesis" or evolutionary realms bordering on abiogenesis. We know from experimentation that viruses are produced by cells, in modern times, cells which were hijacked by the parent virus. Sorry, by definition, Viruses do not and cannot pre-date cellular life. Any common ancestry could easily be explained the way I did above, as a "cellular drone" defense mechanism or sexual reproduction mechanism gone haywire. much easier to explain and model too. You may ask, "How could a virus be beneficial as a maintenance mechanism or as a sexual reproduction mechanism". Well, remember the article a few months back about the beetle which someone aquired the DNA of it's own gut bacteria, whereby the scientists called this "evolution". 1, Endocytosis-still requires a virus-like or prion-like event though. 3, Prion (the gene broke off the gut bacteria's chromosome, or an individual DNA strand, becoming a prion, and then somehow migrated to Beetle's Gamete DNA in at least one strain of the beetle, passing to children. No I mean it proves that you are wrong to speculate without being familiar with the science. Again science by it's very definition proves that you are wrong to speculate. Scientists say that viruses might have preceded cells based on evidence. It is reckless to declare this wrong. This did not come from wiki. Drop it into GOOGLE your buddy to find the source. Viruses are genetic seeds which latch on and alter the genetic information of living cells. A virus changes a cell by adding its DNA to the cells DNA strand. A virus causes a change in the host cell. This is evolution. Now if you think about this for a moment, you will see, how viruses could be precursors to life itself. Would there be any place in our galaxy where the observation of sub atomic particles wouldn't be effected by the black hole at the center and frame dragging? How far will a gravity wave travel? "Quantum causal relations: A causes B causes A"
I mean; how does one drift from quantum causality discussion to rambling on about viruses neither party knows much about without consulting online resources first? ...it is nevertheless fun to observe. viruses can't reproduce without full cell hosts...by definition, Viruses do not and cannot pre-date cellular life. No, by your def viruses known presently cannot do this. Things change. This is called evolution not design. "...therefore it is likely that these two ancient lineages of viruses also share a common ancestor. Probably the ancestor diverged into two different lineages already before Bacteria and Archaea separated into the two distinct domains of life. Altogether, the evidence suggests that the very abundant world of viruses appear to be formed of lineages that emerged before the first cellular domain of life emerged (Benson et al. 2004)...However, we argue that it is more likely that the evolutionary process producing both cells and viruses were actually tightly associated to one another." -There. I threw you a bone. And hey - thanks for actually looking something up. Just like space, time has 3 dimensions. Humans can only perceive one dimension of time. The second dimension of time is the dimension of time where the quantum world resides. It's called superposition. The third dimension of time is called multiverse. In the 2nd dimension of time, all possibilities exists like when we are in the dream state, our consciousness wonders until ours minds observe, we wake up, and our wondering in superposition becomes FIXED in our one time dimension reality, and we lose sight of all the possibilities and become stuck in the here and now. @daywalk3r - it is sad when people confuse the lack of understanding about something with the lack of that things reality. Its like I don't understand about cats, so cats do not exist, and anyone that talks about cats is a crackpot. As much as it is sad to confuse delusions with real understanding. Do some people even realize they are supporting claims for which there is exactly ZERO observational (nor any other type of) evidence? Talk about time travel, zero dimensional entities, Loch Ness, God, (whatever), all you want.. But this is a science site, and as far as I know, one of the very basic tenets of science is, that every CLAIM should be backed by EVIDENCE. And so far, neither the authors of the paper, nor you, have provided a single one..
No, Kron, you get that result because you are inappropriately maintaining assumptions of classical mechanics. If all events exist simultaneously in some sense from a greater perspective, they do so without all being simultaneously observed, because observation is a local, temporal phenomena, or simply interaction, if you prefer decoherence. So, if past-present-future exist at once, they do so in the form of wave-functions in which many possibilities exist. Your experience would be one path through all possible events, as shaped by your interactions and observations, thereby giving you the freedom as a consciousness of determining your path as you go along, although the possibilities from which you select pre-exist. And, re: the article -- is this not already implied by consideration of the full dual-wavefunction's behavior? If every event sends out a wavefunction "spherical" in space-time, into both the past and future, then each event is a handshake between past and future, which makes some degree of circular causality the norm, as events in the future are always partially determining the events in their own pasts. My question is, could this generate meaningful macroscopic effects, and what experiment could we use to look for evidence that current events are being shaped by the future? True. Reality may exist in all possible states simultaneously, experiences (interactions, or whatever) being the collapse into a certain state. So the architecture exists and is free of interaction until we hit run. At this point we begin to carve a path, creating our own reality. So we're on the same page here, I assume? But we can explore this a little deeper. Like, what are we as lifeforms? Are our actions really random, or are we predictable? By this I mean, if immersed in the same environment repeatedly without prior run knowledge, would our run paths differ, or would all paths be identical? If you walk into a room full of girls and all are vying for your attention and you choose the one you like the best, would you end up choosing the same one repeatedly if we brought you back in time to the moment you first walked in?